Did Dad’s Dying Kill Mom? My older sister made that blunt statement on several occasions. I recall, in the way siblings react as the years of a family become decades, that I mostly ignored her. Maybe once or twice I muttered a reply, a weak disagreement. Why argue who’s right or who’s wrong when we were all, each in our own way, struggling to make sense of a senseless experience? Our father’s slip-slide into dementia had put a huge burden of caregiving onto our mother. Though her situation (slightly) improved when he was placed in a memory care facility, the emotional, spiritual, financial, and physical costs to Mom were relentless. She took her wedding vow seriously: for better, for worse; in sickness and health. Was Dad “killing” her? Was she unfairly wearing out because of the commitment to help her sick, aging, stubborn—and yes, beloved—husband? When Mom and Dad were younger, they had a plan for the so-called golden years: live in the house they’d lovingly built into a home until both died in their sleep and then be quietly buried in cemetery plots purchased (and paid off) in the mid-1960s. 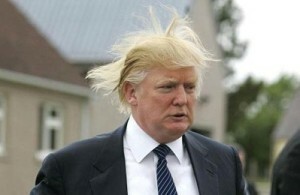 Even the “rich” can have a bad hair day! What I write next is based on the flimsiest of accounts, of me being in the right place at the right time to “overhear” two doctors tell a story about a patient. And hey, since I’m talking about two doctors and a patient, you might think this is the build-up to a swell (or dull) joke . . . right?